This two-story house in Excelsior proves that even a small hallway can't be overlooked when you're trying to sell your house. "Anytime a seller is avoiding an area of their home because they find it so uninviting and dysfunctional, they can pretty much assume potential buyers are going to feel the same way," said Lori Matzke of Centerstagehome.com. Built in the 1890s, this house had been extensively renovated several times over the years, but a back hallway that led to the basement and bathroom and to the garage and gardens had been neglected. The hallway had several problems, including four mismatched doors, worn indoor/outdoor carpeting, poor lighting and a scuffed and dated paint job. And it was being used as overflow storage for paint cans, garden tools and other excess items. "It felt oddly out of place with the rest of the home," Matzke said. "Our goal was to create a layout that felt finished and flowed easily from the kitchen to the bathroom and beyond." She removed the door leading from the hallway into the kitchen to make the hallway feel more like part of the house. She removed the worn carpeting and exposed the original hardwood floors. Then, she sanded and painted the floors with two coats of oil-based paint in a color that complements the colors in the adjoining kitchen and bath. Always use complementary colors if you're trying to create a more even flow from one space to the next. She installed a soft-gold floor runner with a tapestry print that she bought for $49 to give the room more of a sense of warmth. To connect the flow between the kitchen and hallway even more, she enameled the woodwork, cabinet and doors in a color that matches woodwork in the rest of the house. She also installed chrome pulls that match the ones in the kitchen. To play up the high ceilings and make the space feel more happy, she painted the walls a soft shade of smoky green in a scrubbable satin finish. It's a color that matches the accent color in the kitchen linoleum. "We chose a color that would add enough contrast to draw attention to the ceiling height without becoming a major decorating statement on its own." 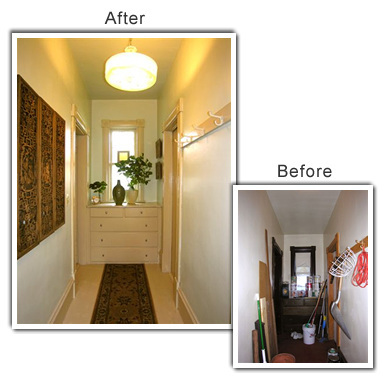 Let there be light: A utilitarian light fixture was replaced with one salvaged from a previous renovation. Matzke had it cleaned and rewired for about $75. A mirror helps reflect even more light into the hallway. And she removed a vinyl roller shade from the only window in the room. To finish the space, Matzke added accessories -- two vases filled with tall greens and a silver mantel clock that provides some drama. And she gave the space balance by hanging a hand-carved dividing screen on the wall opposite the coat hook and doorways.